When I call a restaurant now to book a table my first question is always ‘Is our baby welcome?’ and ‘Do you have a highchair?’ and once that is out of the way I can start to consider things like the menu. So with a resounding yes to both questions we recently visited The StationGrill Bar and Restaurant inLlansantffraid-ym-Mechain, Powys, which has recently changed hands. I had not heard great things about the place in the past but new owners Paul and Julie and a new look meant a clean slate and I have to say from the moment we arrived there on a busy Friday night all of us (including our son Samuel) were made to feel most welcome and the place looked great. The waiting staff were friendly, professional and attentive, but not too all over you and whilst the wooden high chairs wouldn’t win any awards for comfort (he didn’t complain but I am guessing) the main thing was that it was sitting waiting at the table and he was welcome and not just tolerated – as we have felt in other places. More than that the staff went out of their way to make sure food and drink was safely placed – he is at the grabbing and sucking everything stage – and they interacted with him which is always welcome as he loves new faces. As for the food it was of a very good standard. My fish was great and my wife was very happy with her burger and raved about the onion rings, the portions were generous and it was hot and well seasoned. The menu had a good selection of dishes and was all online, (so we could check in advance there would be something we would enjoy) and at the end of the meal we were more than happy to say we could and would recommend eating there. But we would stress the name does not do the place justice as whilst they do make a great steak and burger all the food is off a high standard and not just what you might typically associate with a ‘grill’. I realise as a business you have to decide which customers you want to attract and which you don’t. And I am sure seeing a baby in a restaurant may send some people running for the hills. But as a new parent you realise how precious time and family life is and you come to value businesses that understand this. The value means my family and I are happy to recommend The Station Grill for families and anyone who likes good food served by pleasant staff. It has also got me thinking about my own business. 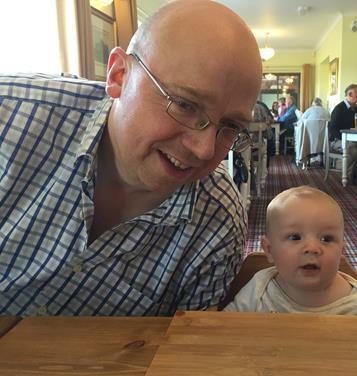 So if you are looking for an accountant who understands the difficulties and importance of juggling family life then I am happy to recommend Welch and Ellis. Children and babies most welcome in the office (we have children’s books, toys and other supplies) and I am always happy to pay you a home visit daytimes, evenings or if need be weekends, too. Children, like Marmite, you might either love or hate but we have all been one once and let’s face it – they are the future!